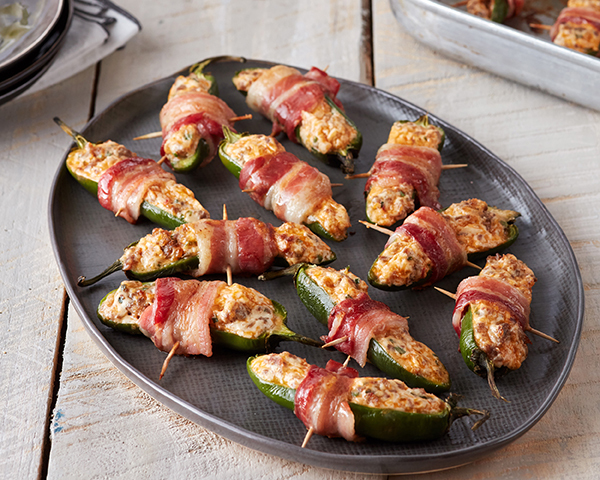 Dale’s Jalapeno Poppers are the perfect tailgating snack. This recipe is one of our go-to for an easy game day snack. Looking for more tailgating recipes check out Dale’s Smoked Chicken Wings with Horseradish White BBQ Sauce. Add the sausage and cook, breaking into small pieces, until browned and no longer pink throughout, about 6-7 minutes. Next, slice each jalapeno in half, lengthwise. Use the tip of a small spoon to scrape out the seeds and white membrane. Then, in a medium bowl, stir together the cream cheese, 1 tablespoon Dale’s Original seasoning, chives, cheddar, and cooked sausage. Fill pepper halves evenly with the cream cheese mixture. Next, slice each bacon piece in half crosswise. Then, wrap one piece of bacon around each stuffed jalapeno half. Next, secure the bacon with a toothpick. Place cut side up on a foil-lined sheet tray. Continue to brush the bacon evenly with remaining 2 tablespoons of Dale’s Original Seasoning. Finally, bake until the bacon is crispy and the peppers are tender, 20-22 minutes.